Causes of Aging - Long Distance Running!?! When most people consider the causes of aging, they likely do not include activities like jogging. In fact, I bet a lot of people consider running to be a healthy activity, something that helps to keep you young. I've come to believe that this idea is dead wrong. In my previous article on running, I outlined why I believe that it is not a natural exercise, which is why running injuries are so common. In this article, I'll expand on the idea of why running not only causes injury, but also ages you pre-maturely as well. Human cells contain tiny structures called mitochondria. Mitochondria are essentially the power plants that generate energy to keep the cells (and, by extension, the human body) alive. However, what happens sometimes is that the mitochondria will produce molecules called ‘free radicals’. 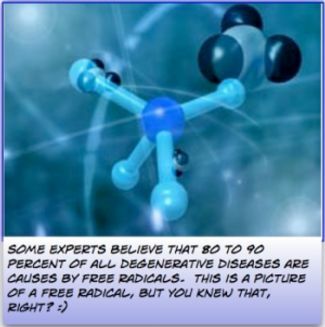 “Free radicals” are molecules that contain a free electron. This free electron is highly reactive, and can bond with other, healthy cells, damaging them. This process is known as the free radical theory of aging. Much of modern anti-aging theory is focused on reducing the presence of free radicals, and therefore slowing the visible aging process. Now, consider running. As I stated in my previous article, I do not believe human beings evolved with any need to run at a moderate pace over long distances. Like most animals, we either walked, or learned to run very fast for short periods. Our bodies are not adapted for long distance running at all. Following this train of thought, I infer that the mitochondria are at their most inefficient when jogging/running. I’m willing to bet that this is when the most free radicals are produced. This is why serious marathon runners look so tired and worn. Although they believe that running is a healthy activity that is beneficial to the body, what they are really doing is rusting their bodies from the inside out with the excessive production of free radicals. I believe that the human body has evolved overtime to have two speeds, fast and slow. If you force it to perform at a medium gear for which it is not adapted by evolution, you are doing more harm to yourself than good. What do you think about my theory that running is one of the major causes of aging? Am I on the right track, or am I all wet. Either way, I'd love to hear from you. If you have a comment or question, feel free to use the comment form on this website.